Finns are getting moving with solutions that fit their customers to a T.
Finnish flair for footwear is being recognised around the world. If the shoes fits, wear it, as the old adage goes. With that in mind, Finland’s fresh approach to covering feet is winning global appeal. Shoe designer Terhi Pölkki was 19 years old when her lifelong love affair with shoes had its first spark. She had always wanted to be a fashion designer, but working in a shoe shop during a gap year made her focus on footwear. After studying shoemaking in Finland, Pölkki was determined to do a master’s degree in London. 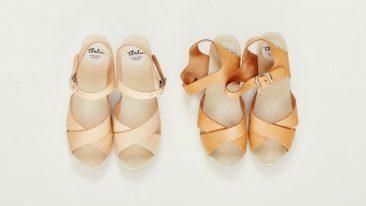 Her own brand, Terhi Pölkki Shoes, followed in 2011. The world knows about how Nokia connects people, but the company actually has a long and colourful history that has included excursions into rubber tyres and boots. When Nokia Corporation decided to focus solely on phones and telecommunications at the turn of the 1990s, these specialities became stand-alone companies. Nokian Footwear’s rubber boots combine practicality and design, and have attracted such collaborators as Julia Lundsten, known for her shoe brand Finsk. “Everyone knows that Nokian Footwear’s boots are high quality and have good master plugs. Already as small children, we are taught that they last a lifetime,” she pointed out in 2014. Helsinki-based boutique shoemaker Janne Lax is looking to bring together the best of two worlds: the comfort of bespoke shoes and the flair of street footwear. However, he is not intent on building a shoe empire, but rather on pursuing smart growth by continuing to put quality first. “Our biggest challenge is to get people to try on our shoes, because often it’s easy to tell that they can feel the difference on their feet – as it shows on their face,” he stated. The origins of this custom insoles company go back to founder Erkki Hakkala’s background as a physiotherapist specialised in podiatry. He observed that patients were willing to pay hundreds of euros for custom insoles and wait for them for up to three weeks. “I realised that if we could make an insole that would be at least as good, but quicker and cheaper to make, there would be a huge market for it – not only in Finland but internationally,” Hakkala stated. It takes less than 10 minutes to analyse and produce the moulded insoles. Unsurprisingly the company is gathering speed: 90 per cent of its sales come from abroad. This internationally recognised Finnish footwear and accessories designer has held numerous positions with top-tier, international fashion labels and consulted with numerous brands such as Finnish footwear heritage brand Lahtiset.